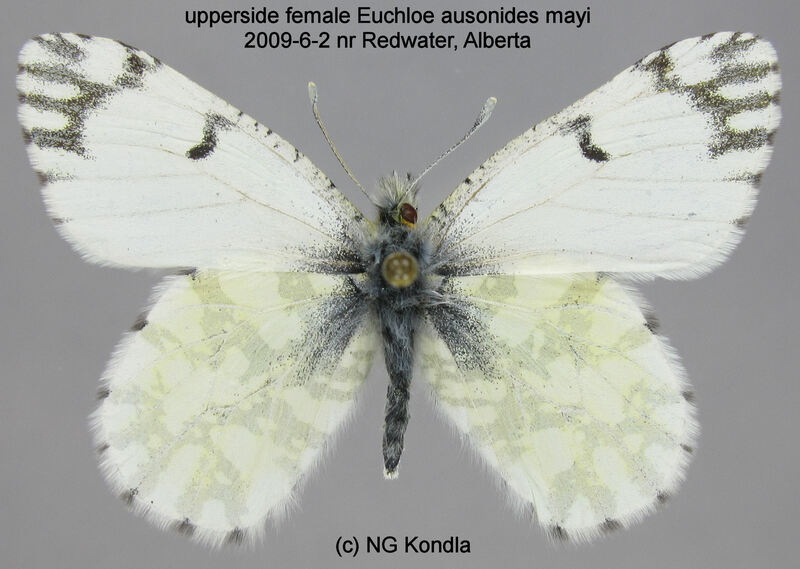 Identification: Scattered white scales in forewing black bar. Black pattern on tip of upperside of forewing. Dense green marbling on underside of hindwing. Wing Span: 1 1/2 - 2 inches (3.8 - 5.1 cm). 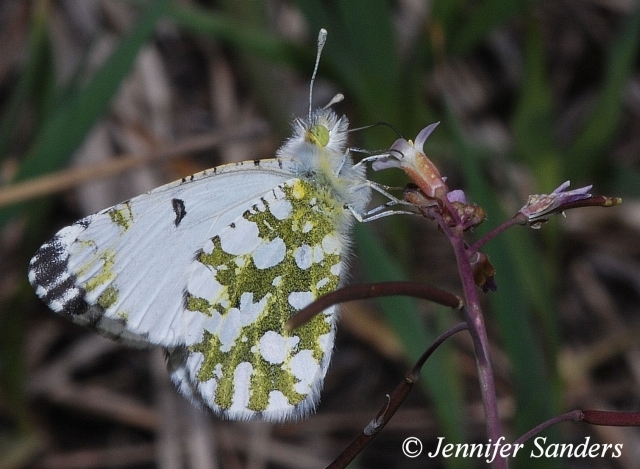 Life History: Males patrol valleys and hillsides for females. 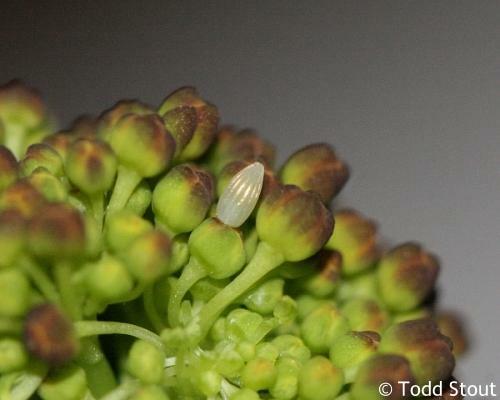 Eggs are laid singly on unopened flower buds; caterpillars eat flowers and fruits. Chrysalids hibernate. Flight: One in the north, May-July; two in central California, February-April and May-August. Caterpillar Hosts: Plants of the mustard (Brassicaceae) family including rockcress (Arabis drummondi), dyer's woad (Isatis tinctoria), mustards (Brassica species), and hedge mustard (Sisymbrium species). Adult Food: Nectar from flowers of the mustard family and other plants such as fiddleneck (Amsinckia) and brodiaeas. Habitat: Valleys, hillsides, fields, meadows, and other open sunny areas. Range: Alaska south to central California and northern New Mexico, east to southwest Manitoba. 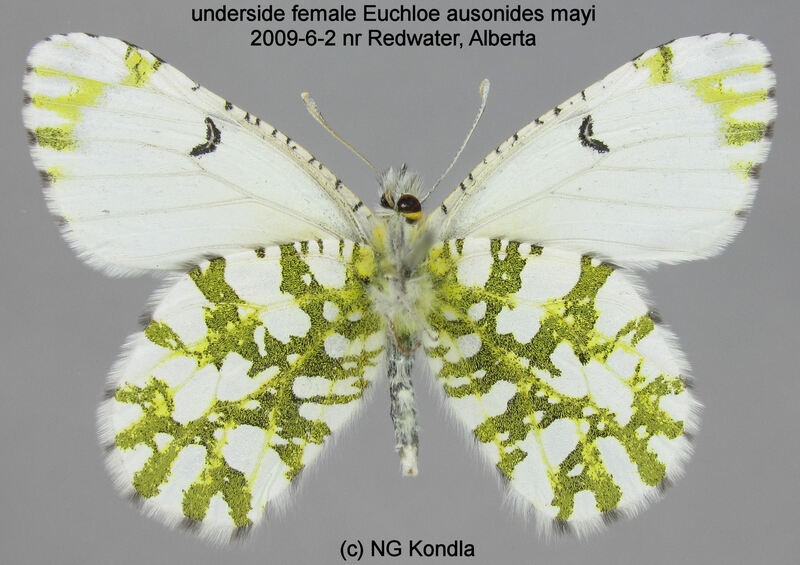 Conservation: The Island Marble (Euchloe ausonides insulanus) is critically imperiled. It was thought to be extinct but has been rediscovered on San Juan Island (Washington). 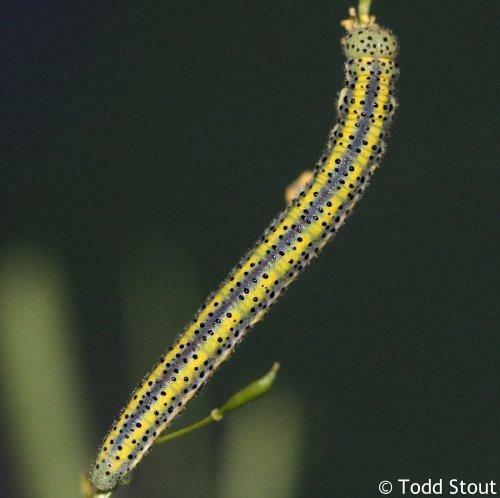 Conservation efforts focus on restoring its ecosystem - the Puget Sound lowland prairie. NCGR: G5 - Demonstrably secure globally, though it may be quite rare in parts of its range, especially at the periphery. Subspocies insulanus is T1 (Critically Imperiled).